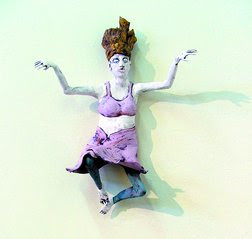 Judy Brey’s ceramic sculpture “Tiny Dancer” ($225) is part of the “Smaller Than a Breadbox” show. The DAC Library Gallery is a small, cramped space like an attic, with a sloped ceiling and low-level bookshelves. For many years, local artist Mary Ellen Long and a committee that currently includes Louise Grune-wald, Deborah Gorton and Jane Steele have coordinated shows that are either art-book-related or small enough to fit the space. “Smaller Than a Breadbox” is the obvious title of the current exhibition where local artists were invited to participate, including: Ed Bolster, Judy Brey, Mike Brieger, Sandra Butler, Debra Greenblatt, Ed Kruse, Grace Kruse, Cuatro Kruse, Jules Masterjohn, Maureen May, Karen Pittman, Joan Levine Russell and Amy Wendland. The work hits a broad spectrum. Some of the painting is simply bad and an embarrassment to painters. But some of the work is Big Art in a small package, big ideas in small form. Judy Brey’s “Tiny Dancer” is a small ceramic sculpture, one of her best. A female figure leaps, arms outstretched; toes and figures are spread; hair flowing. There is movement and motion in the work. The figure’s intentionally imperfect face, with mouth agape, adds to the humor and confidence expressed in the work. Along the back wall is some of the best work in the show. Maureen May’s “Retrieving the Hand, Reviving the Heart” is a mixed-media sculpture that features a beautiful color pencil drawing of a hand, with visible veins and blood vessels; the drawing is torn and stitched back together with red thread, held up by wires and clips from a base that is wrapped in text. A magnifying glass prompts the viewer to look more closely at the detail. Wrapped around the magnifying glass is a quote by Lao Tzu, “A journey of a thousand miles must begin with one step.” My hunch is that the hand is a drawing of the artist’s own and that the work speaks about a personal struggle creating art. May’s work is technically superior and equally thought provoking. I long to see more. Also along the back wall is a small toy sculpture by Amy Wendland, “Unstill Life (Homage to Morandi).” The work features a wooden base, tiny wooden wheels and a pull cord. Atop the base are ceramic vessels, milk jugs and vases as seen in the still-life paintings created by Giorgio Morandi in the early 1900s. Morandi painted the same object in the same place, just slightly moved. I love that Wendland made her Morandi vessels moveable, in little slots so they can be adjusted slightly. It’s a brilliant and funny commentary on the work of another artist. A second person commenting on the work of another artist is Jules Masterjohn, whose “They Are All One Thing” mixed-media assemblage is an exploration of her experience writing the upcoming book about Stanton Englehart A Life on Canvas. Englehart has said that his paintings are all one thing. Masterjohn’s assemblage features a tree growing through layers of shelves. The background is the universe with planetary objects mapped. The shelves are lined with the outlines of parcels of land and streets. Tiny river rocks fill the base. More than an exploration of Englehart, the work is about Masterjohn herself who just turned 50. The tree growing through the layers seems to me to be her, moving through the obstacles of life; rooted in a river, but reaching for the universe. The strong work in this exhibit overshadows the weak, and the size of the art means one has to get up close and personal with the work. That’s a good thing. “Smaller Than a Breadbox” 10 a.m. – 5 p.m. Tues-Sat., through Jan. 4, Library Gallery, upstairs, Durango Arts Center,802 East Second Ave., 259-2606.